PEPLUM genre star Pierre Brice, who appeared in several PEPLUM films, earlier this June. He was 86 years old. Most notably Pierre played Dionysus in THE BACCHANTES, which is one of my favourite PEP films ever. I'm sad. His other films are THE PHARAOHS' WOMAN, THE COSSACKS and another favourite SAMSON AND THE SLAVE QUEEN or ZORRO VS MACISTE. Brice played Zorro. RIP Dionysus. Also, British actor Richard Johnson died at the age of 87. 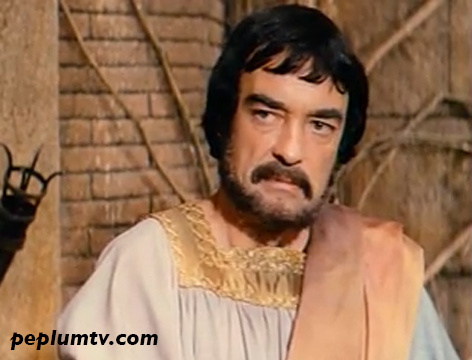 Though his PEPLUM films are not as extensive as Pierre's, Richard Johnson did leave a mark in the genre with two notable roles, in JULIUS CAESAR (above) and COLUMNA (below). Oddly enough, both Pierre and Richard died on the same day, June 6. All the PEPLUM stars are dying. I agree that THE BACCHANTES is an excellent Peplum, but Pierre Brice's hair is quote over the top unquote (a saying dating from WWI trench warfare).